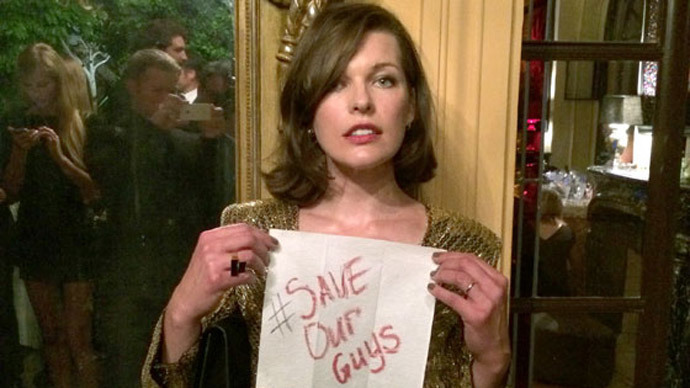 Milla Jovovich holding a sign with a hashtag #SaveOurGuys to support the Russian journos detained in Ukraine. Hollywood star Milla Jovovich has appeared in Cannes sporting a sign with the hashtag #SaveOurGuys, calling for the release of two Russian journalists detained in Ukraine a few days ago. The 38-year-old actress held a sign in front of the public, expressing her attitude towards the actions of Ukrainian authorities who detained two Russian reporters on May 18. The journalists’ fate remains unknown, as are their whereabouts. Their lawyer Tatiana Khokhlova told RT that the current situation demonstrates a breach of Ukrainian law. “We’ve made an official contract with the Ukrainian lawyers, as Russian lawyers can’t act on Ukrainian territory, and those attorneys officially represent both Oleg Sidyakin and Marat Saychenko. Unfortunately, over the last three days, our Ukrainian colleagues weren’t able to meet with the men; it wasn’t possible to determine their location or their legal status, so to speak," Khokhlova said. 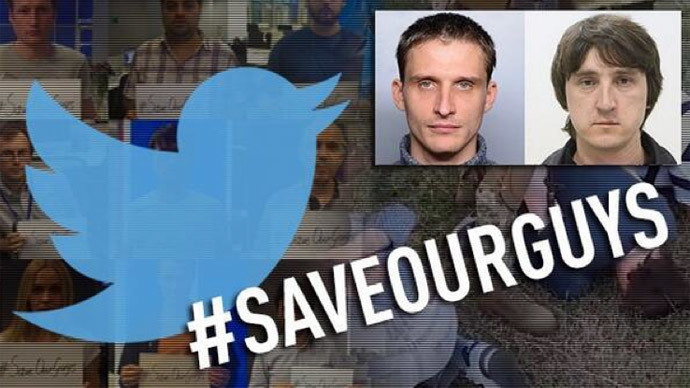 The hashtag #SaveOurGuys has become popular online, with Russia’s UN Mission, celebrities and fellow journalists posting pictures of the sign on Twitter. “Press freedom is a fundamental human right. All actors must fully respect human rights standards and refrain from any action that puts journalists at risk. Journalists detained because of their professional activities must be immediately released and violations of press freedom should be sanctioned,” Muiznieks stated. Earlier on, Human Rights Watch demanded from the Ukrainian government to immediately free journalists Oleg Sidyakin and Marat Saychenko or make it clear what the charges, if any were against them, said its statement received by ITAR-TASS. HRW also called for the Ukrainian authorities to ensure the journalists have access to a lawyer and consular services. On Wednesday, LifeNews media outlet boss denied all Ukraine’s accusations of illegally transporting weapons and “aiding terrorism” against his employees. The journalists held in Ukraine didn’t violate the Ukrainian laws or conceal the purpose of their visit - they simply stated one of the reasons they were in Ukraine, the outlet’s general director Ashot Gabrelyanov told Interfax. The detention of LifeNews reporters has been a subject of discussions at the meeting of the OSCE Permanent Council in Vienna on May, 22. Russia has expressed disappointment with results of the meeting as Kiev ignored demands by the OSCE observer mission to let them meet Sidyakin and Saychenko. “[We] consider absolutely unacceptable the situation when detained journalists are being denied meetings with lawyers, consulate workers and OSCE representatives,” the Russian Foreign Ministry said in a statement. “Such actions by those who rule in Kiev are a harsh violation of the universally recognized norms and standards in the field of human rights, observation of which is guaranteed by a number of universal and regional international treaties,” it added. Meanwhile, another journalist who had been reporting for RT from Ukraine and was detained on May 20, Graham Phillips, was released after 36 hours without any charges pressed.